Benko said no materials were exchanged and no notes were taken, and he said he didn’t even send notes to the commissioners about the discussions. Benko said Oconee County initiated the meeting, which took place in Mayor Nancy Denson’s office in Athens. Denson was accompanied in the meeting by Unified Government Manager Blaine Williams, according to Benko. Oconee County is in the process of considering ways to expand its limited sewage treatment capability. The county told the state Environmental Protection Division last month that it needs to expand its Calls Creek plant to 1.5 million gallons per day of treatment capacity to meet county needs through 2025, or nine years from now. At present, the county has only a little more than 1 million gallons per day of treatment capacity, but it has sold an additional 0.8 million gallons per day of treatment capacity it does not currently have, and the county projects it will need to expand to 3.4 million gallons per day of capacity by 2035. By 2050, the county expects it will need nearly 5 million gallons per day of sewage treatment capability, and it is asking the state to reserve that capacity for the county. Oconee County has only its 0.667 million-gallon-per-day plant on Calls Creek on the northeast edge of Watkinsville and a 0.4 million-gallon-per-day Land Application System facility on Rocky Branch Road behind North Oconee High School. Athens-Clarke County, in contrast, has three plants that can treat a total of 28 million gallons per day. The largest plant is on the North Oconee River off College Station Road. It has a capacity of 14 million gallons per day. The unified government has another plant on the Middle Oconee River close to the Oconee County border that can treat 10 million gallons per day of sewage. The plant is at the end of Will Hunter Road, which connects to South Milledge Avenue. Athens-Clarke County has a third plant off Barnett Shoals Road that can treat 4 million gallons per day. 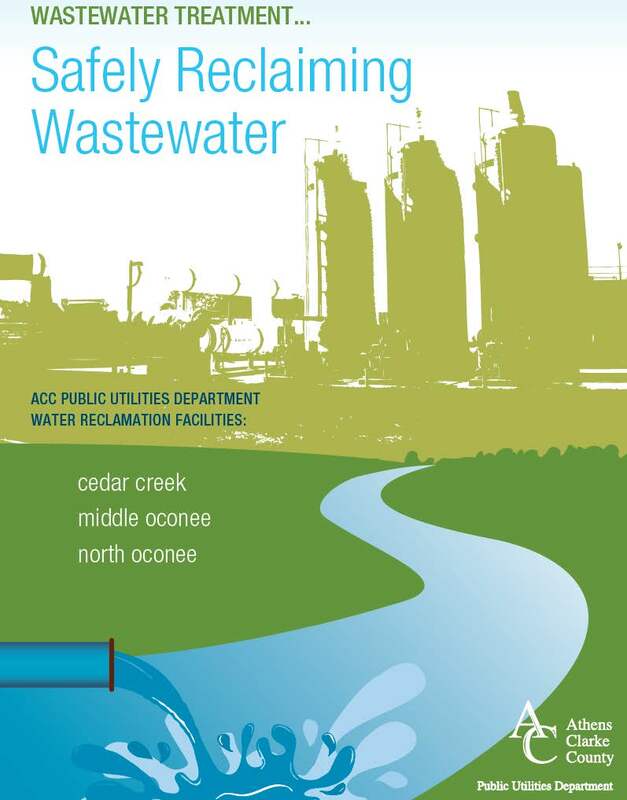 All three Athens-Clarke County wastewater treatment plants discharge into the same river system. The North Oconee plant discharges into the North Oconee River before it joins the Middle Oconee River to form the Oconee River. 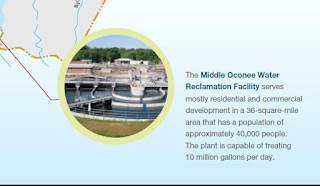 The Middle Oconee Plant discharges into the Middle Oconee River, and the plant off Barnett Shoals discharges into Cedar Creek, a tributary to the Oconee River. Calls Creek in Oconee County is a tributary to the Middle Oconee River, and the Rocky Branch LAS site is on Barber Creek, which joins McNutt Creek, a tributary to the Middle Oconee River. Because the two counties share the Oconee River basin, they are in competition for state allocations to discharge treated sewage water into that river. The meeting between the leaders of the two counties appears on the calendar of Chairman Davis for 10:30 to noon on June 30. I obtained that calendar via an open records request I did of Davis’ calendar entries for the year for another purpose. The calendar entry does not indicate the nature of the meeting, but I learned about the sewage discussions indirectly and asked county Utility Department Director Wayne Haynie for details. The meeting had not been acknowledged or discussed in any public setting in the county. The Oconee County Utility Department Long Range Wastewater Strategies Final Report of 2005 listed “regional facilities” as an option for the county. “The positive aspects–economies of scale, larger political voice, pre-existing discharge locations/plant sites–of a regional facility outweigh any negative aspects–loss of control or additional coordination,” the report states. Athens-Clarke County’s Middle Oconee treatment facility is just upstream from the confluence of McNutt Creek and the Middle Oconee River, very close to River Club student complex in Athens-Clarke County and the Athens Ridge student complex in Oconee County. That Long-Range plan envisions Oconee County constructing a treatment plant of its own on the Middle Oconee River downstream from the Athens-Clarke County facility. The Oconee plant would be in the vicinity of where Simonton Bridge Road crosses the Middle Oconee River. That long-range plans also envisions a gravity flow sewer line running along McNutt Creek all the way from Bogart to the Middle Oconee River plant. That proposed line would flow behind Athens Ridge complex and very close to the Athens-Clarke County Middle Oconee treatment plant. The county has built or is building the part of the McNutt Creek line running from Bogart to Epps Bridge Parkway. The county has done nothing to construct the sewer line downstream from that site, and it has not purchased land for the Middle Oconee plant. Instead, it is considering directing almost all of the county’s sewage to an expanded plant on Calls Creek and constructing a sewerage discharge line from that plant down Calls Creek to the Middle Oconee. Those sewer line plans have met stiff resistance from residents along Calls Creek. Oconee County already has two intergovernmental agreements with Athens-Clarke County for treatment of sewage. Athens-Clarke treats sewage from a residential area in Oconee County along McNutt Creek north of SR Loop 10 and from St. Mary's Highland Hills Village on McNutt Creek downstream from SR Loop 10 on Jennings Mill Road. The original agreement was signed in 2003 and renegotiated and signed in 2014. The second agreement is for treatment of waste from the Caterpillar plant, which straddles the county line on the eastern side of Bogart. That agreement is dated 2012. Oconee County also has an agreement, signed in 2005, to send sewage from the area round the Georgia Club to Barrow County for treatment. The plans are for Oconee County to suspend the flow of sewage to Athens-Clarke County from the residential area along McNutt Creek and from St. Mary’s as soon as the McNutt Creek line is completed. That sewage will then flow by gravity to Epps Bridge Parkway at Kohl’s and from there be pumped to the Calls Creek plant. The county does not have the ability at present to treat the industrial effluent from the Caterpillar plant. Once again we have to depend on Lee to find out about something that should of have been public knowledge. They say the dixie mafia died out years ago but it evident they just found a new home on the BOC and county govt. So, we have the ability to treat a lot less sewage than we have promised to treat. Great planning commissioners! Thanks for finding this, Lee. You are a real detective for open government. If I'm up to date on my public meeting law, this type of meeting doesn't require a notice since there was no majority of either commission in attendance... So I don't see why a meeting between the leaders of Athens and Oconee is a a cardinal sin. Secondly, it would be good for Athens and Oconee to work together on water and sewer. Athens has faced tough droughts in the past, and Oconee could provide water out that big reservoir project. Oconee needs sewer, and Athens could partner with Oconee to treat sewage. Maybe there is a cost-free solution for both parties, and that's what Benko and Davis were exploring. Folks, if you're worried about paying the enormous cost to build a new sewer plant, or if you're worried about the potential Calls Creek line, you should encourage these type of partnerships between Athens and Oconee. You asked our leaders to look for alternatives... Don't bash them simply for doing what you asked. The people who should be paying for sewers/new plants sholud be the ones who directly benefit from them. The meeting was not a violation of the state's open meetings laws. A quorum of neither governing body was present. Neither government was under any legal obligation to make the meeting known to the public. Collaboration between the two counties requires a willingness to work to the mutual benefit of both counties on many issues. Recently residents of Athens-Clarke asked the OC Commission for protections against light trespassing and riparian buffer damage from a new shopping center planned along the county border. The response from an OC Commissioner was "sounds like an Athens problem to me." This sewer capacity problem sounds like an Oconee County problem. Regarding water, ACC uses very little water from the Bear Creek reservoir. It is there for ACC to use in case of a drought. Water conservation measures have worked very well in ACC. ACC does not need additional water capacity. The previous comment should resonate with Oconee Commissioner Jim Luke, who dismissed the grumbling of Kingswood residents after BOC approval of the Epps Bridge Center expansion. So long as Oconee does not care about light trespass and McNutt Creek water, why should Athens-Clarke care about solving Oconee's sewer problems? For a little neighborly consideration, Benko and Davis should try a little honey next time. Athens residents should protest ACC treating Oconee County sewage. The above post are right, Oconee County didnt care about your quality of life.